G, BSP, BSPP thread nickel plated brass push to connect fitting female elbow is used to connect tubing to male G, BSP, BSPP threaded connection at a 90-degree angle on a swivel threaded sub-base. G, BSP, BSPP thread nickel plated brass push to connect fitting female elbow is made of durable nickel-plated brass to meet clients' technical and environmental requirements. 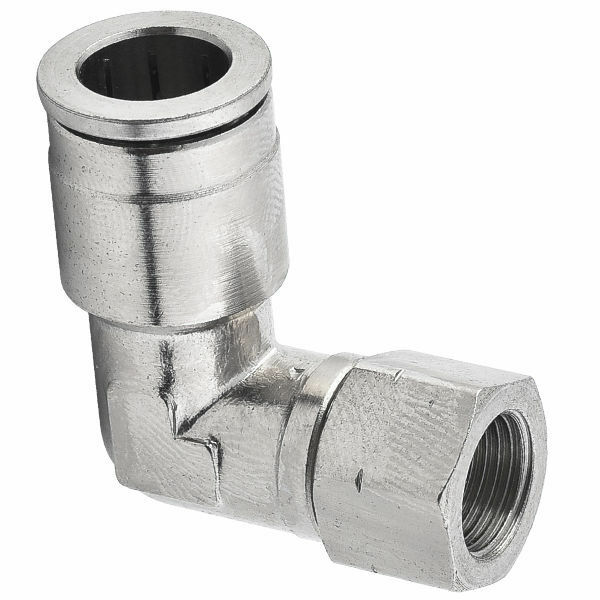 The body of G, BSP, BSPP thread nickel plated brass push to connect fitting female elbow with threaded connections can be rotated after installation to allow for variations in tube direction. G, BSP, BSPP thread Nickel plated brass push to connect fitting female elbow offers the robustness, reliability and resistance to industrial fluids for the most demanding environments. G, BSP, BSPP thread nickel plated brass fitting female elbow is used in pneumatic applications like robotics, conveyor systems and any system requiring the transfer of compressed air or some liquids compatible with the materials of manufacturing. Female elbow nickel plated brass push in fittings are available in both inch and metric sizes, and can be used with a variety of tubing materials, compatible with polyethylene, polyurethane, FEP & nylon tubing. Female elbow nickel plated brass pneumatic fittings have hexagonal thread allowing tightening with wrench, additionally our fittings can be screwed with Allen tool, which is especially convenient where there is limited access to installation place. Accommodate metric tubing O.D ranging from 4 mm to 16 mm and inch tubing O.D 1/8" to 1/2". Thread sizes range is from BSPP, BSP, G 1/8" to BSPP, BSP, G 1/2".